Learn about the different types of window condensation. Learn about tips to help avoid window condensation. Solutions for fixing window condensation. Window condensation can be downright irritating, and in some cases, it can even damage your home, especially if you have older windows. It can rot wood molding and damage plaster, and the excess moisture in your home, which causes interior condensation, can damage your entire home, not just the areas around the windows. Interior window condensation is caused by excessive moisture in the house, and it often occurs in the winter when the warm air inside the house condenses on the cold windows. Exterior window condensation is simply dew and occurs when the window is colder than the dew point. Condensation between window panes occurs when the seal between the panes is broken or when the desiccant inside the windows is saturated. For more information about the causes of window condensation, read pages 23-26 in our maintenance guide. Interior condensation, or the condensation that occurs on the inside of your windows, is the most common type, and there are a variety of things you can do to remedy the problem. You might notice condensation in your bathroom, kitchen, or nursery. In the nursery this problem is often caused by a humidifier, which many parents use. If you use a humidifier in any part of your home (including the humidifier that works with some furnaces), you can try turning it down. As a result, the humidifier will release less moisture into the air, which will hopefully reduce condensation. If you suspect that there is excess moisture in certain areas of your home, you can purchase a moisture eliminating product, such as DampRid. These products often come in buckets that you can set on your floor or in bags that you can hang, typically in your closet. You can use these products in your bathrooms, kitchen, or closets (where they will also help protect your clothing from moisture damage), and they will remove excess moisture from the air. Use your bathroom and kitchen fans every time you cook or shower. Showering and cooking releases a lot of moisture into the air, and sometimes this moisture cannot escape from your house easily. The exhaust fans in your kitchen and your bathroom help remove this moisture from the air. You want to run the fans for about 15 to 20 minutes after you shower or cook. Circulating the air can also help reduce the condensation on your windows. So, use your ceiling fans even in the winter. You want the fans to rotate in a clockwise direction to push warm air off of the ceiling back down to the floor. If it isn’t too cold, you can open your windows. This will release some of the warm, moist air that is trapped in the house. Raising the temperature of the windows will reduce the condensation on them. Condensation occurs when warm air hits a cold surface (the window). Think about taking a cold drink out of your fridge on a warm day. The surface of the can immediately gets wet. In order to raise the temperature of your windows, you can raise the temperature of the house slightly. You can also use blinds, curtains, or drapes to raise the window temperature as well. Adding weather stripping to your windows can help keep warm air from leaving your home. 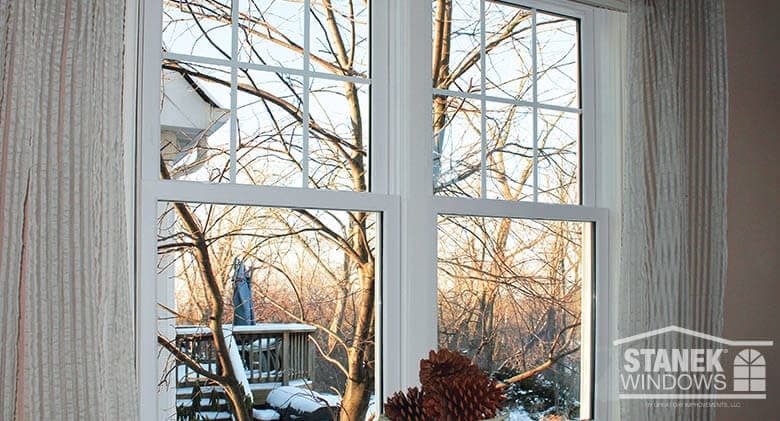 This can help reduce condensation if you’re using storm windows during the winter months. Weather stripping also helps make your home more energy efficient. If you have older windows in your home, using storm windows during the winter months can help reduce condensation on your interior windows. The space between the two windows allows the interior window to stay warmer. 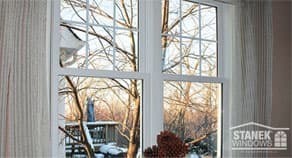 Storm windows can also help reduce your heating bills during the winter. While storm windows themselves can sometimes have condensation, they do reduce the condensation on the interior windows, which helps reduce frost buildup. 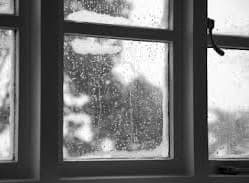 Condensation on the storm windows often indicates a leak in your interior windows, and you will want to check and/or reapply your weather stripping. Plants release moisture into the air, so if you have a number of plants by your windows, moving them to a different place can help reduce condensation on the windows. Purchasing a dehumidifier is an easy, expensive way, to remove the moisture in your home. If a full size dehumidifier, which is usually $200 to $300, is too expensive for you, you can also look into purchasing a mini dehumidifier. Some dehumidifiers will need to be turned on and off, while others will come on automatically when the humidity level in the home reaches a certain point. An air to air exchanger is another fairly easy, yet expensive, way to reduce moisture, and therefore condensation, in your home. An air to air exchanger brings in fresh air from the outside and sends indoor air to the outside. These machines remove pollutants from your home as well as removing the moisture. Window insulation kits can be installed on the inside or the outside of windows, and they can prevent interior condensation when installed on the inside. When installed on the outside, they can help reduce energy costs, but they do not reduce condensation. Additionally, if you have condensation between an interior window and a storm window, sealing the interior window can help reduce this problem. These kits have the added benefit of reducing your heating and cooling bills. Watch our window insulation kit installation video. Most people know about using Rain X on their windshields, but it can also help reduce condensation on your windows. By applying Rain X to the exterior glass, you can reduce exterior condensation. It makes the water gather together and run off of the window. As the sun warms up the windows, the condensation will evaporate. Just like the dew evaporates off of your car and your lawn, it will evaporate off your windows as well. If you think that you have condensation between the windows, be sure to clean them off first. The haziness might in fact be caused by condensation or it may be caused by a buildup of something, such as a cleaning product or grease (in the kitchen). Unfortunately, if you do have condensation between window panes, you will have to replace the glass units. This may or may not be possible depending on the type, age and manufacturer of the original window. In some cases, you will not be able to replace the glass units, and you will need to replace the whole window. This is usually a good idea especially if the windows are old. Great strides have been made in window technology over the years and replacing the entire window may have added benefits as well. 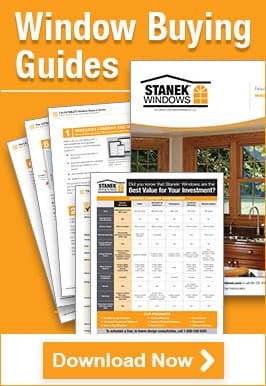 If you are considering replacement windows and doors for your home, consider Stanek Windows! A Stanek Windows professional can answer all of your window condensation questions and help with your window replacement needs. Schedule your FREE In-Home Estimate or call 800-230-8301 today!